GE bulls were emboldened by the eye-popping Biopharma sale. The following chart illustrates how GE's debt is at junk levels before and after the Biopharma deal. Another ratings downgrade could sink the stock. Sell GE. Moody's suggested another downgrade could be forthcoming if (1) GE was unable to sustain free cash flow ("FCF")/debt at around 7% or (2) there was not a steady improvement of debt/EBITDA towards less than 3 times. A few months ago the company sold GE Biopharma to Danaher (DHR) for an eye-popping $21 billion, or about 17x EBITDA. The transaction will allow GE to pare a sizeable chunk of its debt and improve its credit metrics. Bulls assumed GE's debt problems would magically disappear. That may not be the case. GE was put on notice about Power's performance six months ago. However, Power's demise has continued. Its Q4 2018 revenue fell 25% Y/Y and it reported another operating loss. CEO Larry Culp recently divulged Power remained a multi-year turnaround, and he expected negative FCF for 2019, mainly due to weakness at Power. This could give the rating agencies cover to downgrade GE again. Time may not be on the company's side as Power's disruption by renewable energy continues. Analysts are worried about the consequences of a potential downgrade to non-investment grade status. Those worries could be well-founded. By my estimation, GE's total debt/EBITDA was at junk levels before the Biopharma deal; it will likely be at junk levels after the deal is completed. GE's FCF has continued to deteriorate. Industrial FCF for 2018 was about $4.5 billion. It is expected to be negative this year so it would not meet Moody's expectations. I provided a table below to illustrate GE's proforma credit metrics (debt/EBITDA) after closing the Biopharma deal. In all, $25 billion in debt should be reduced on the GE Capital side of the business, bringing leverage down to under 4 by next year, even as it pays its $1.5 billion WMC settlement and covers the $2 billion in annual insurance payments required of it. This compares to a net leverage ratio of less than 2.5 for the conglomerate's Industrial operations. In my opinion, evaluating GE's debt is more of an art than a science. Under normal circumstances, bifurcating industrial debt and GECC debt would make sense. However, this is not a normal situation for GE. The company's funding costs spiked in Q4 2018 after it was forced to abandon the commercial paper market. I suggested the subsequent run-on-the bank would crimp GECC's profits, and I was loud about it. GECC's 2018 segment profits were -$489 million. Larry Culp has not addressed (1) GECC's revised funding costs or (2) how badly its assets have been impaired. Given the diminution at GECC, I believe GE's credit rating should be measured based on total debt/EBITDA. 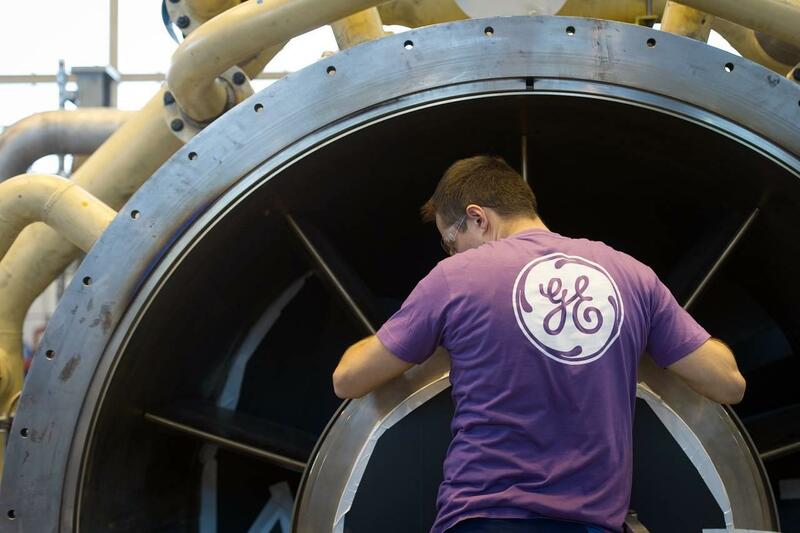 GE's full-year 2018 segment profits less corporate eliminations, plus depreciation and amortization would be around $15.7 billion. This figure includes segment profits from GECC. GE's current debt/EBITDA would be around 7.0x. 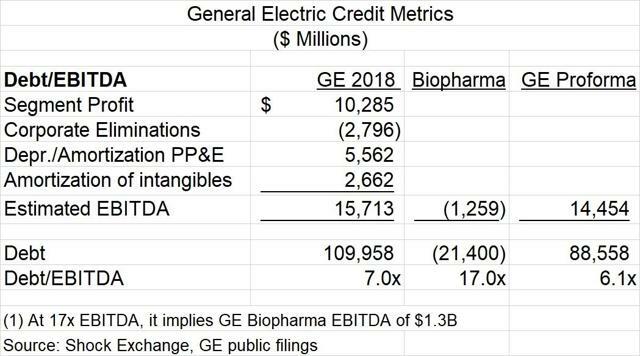 GE will forgo $1.3 billion of Biopharma EBITDA and pare $21.4 billion of debt (assumes no tax leakage). This would leave GE with proforma EBITDA and debt of $14.5 billion and $88.6 billion, respectively. Proforma debt/EBITDA would be 6.1x or junk status. A metric at or above 5.0x would usually be considered junk status. GE's CEO has trumpeted the Biopharma deal. However, total debt/EBITDA still appears to be at junk status. GE's debt appears to be at junk levels before and after the Biopharma deal. Another ratings downgrade could increase GE's borrowing costs and hurt sentiment. Sell GE. I also run the Shocking The Street investment service as part of the Seeking Alpha Marketplace. You will get access to exclusive ideas from Shocking The Street, and stay abreast of opportunities months before the market becomes aware of them. I am currently offering a two-week free trial period for subscribers to enjoy. Check out the service and find out first-hand why other subscribers appear to be two steps ahead of the market. Pricing for Shocking The Street is $35 per month. Those who sign up for the yearly plan will enjoy a price of $280 per year - a 33% discount. Disclosure: I am/we are short GE. I wrote this article myself, and it expresses my own opinions. I am not receiving compensation for it (other than from Seeking Alpha). I have no business relationship with any company whose stock is mentioned in this article.